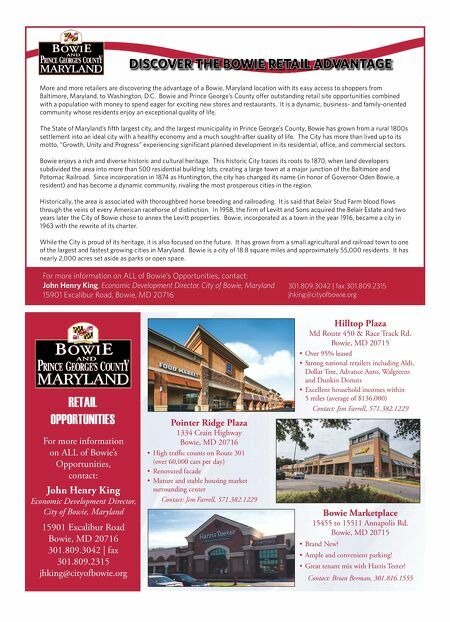 ECONOMIC DEVELOPMENT 44 • SHOPPING CENTER BUSINESS • June 2018 include brick-paved sidewalks, pedestrian lighting and rebranding downtown with unique street and gateway signage." GOING LOCAL IN MORENO VALLEY Moreno Valley, California, sits in a quickly growing city in Inland Empire, just west of Riverside and about one hour outside Los Angeles with easy connectivi- ty to San Diego, Orange County and San Bernardino. More than 2.3 million people live within a 20-mile trade radius of the city, home to two regional shopping des- tinations and 40 shopping plazas. Moreno Valley is fostering a pro-busi- ness climate to promote growth. The city owns the electric utility agency and offers development incentives such as utility cost reductions for hiring from the local workforce, through the Hire MoVal pro- gram, as well as several other energy-rate savings. Many companies are taking advantage of the perks of locating in Moreno Valley. Some 14,000 jobs have been added to the workforce in the past four years. Fifteen new restaurants opened in 2017. Twelve existing hotels are open in the city, and three more are under construction. Housing is growing as well, with ap- proximately 7,000 single and multifami- ly units in development. Moreno Valley is also home to the county's Riverside University Health System and Kaiser Permanente. The city recently formed a special con- cierge service and a quick-response "strike team" to assist developers and businesses with needs as they arise. "The city's turn- around times are unparalleled," says Mike Lee, economic development director. "They consistently beat other agencies in the region. 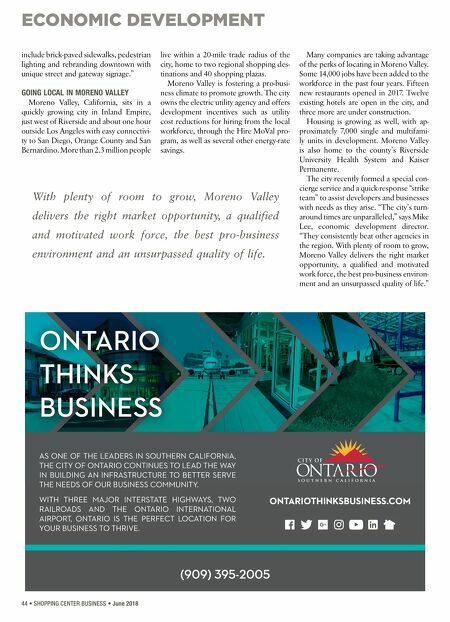 With plenty of room to grow, Moreno Valley delivers the right market opportunity, a qualified and motivated work force, the best pro-business environ- ment and an unsurpassed quality of life." WITH THREE MAJOR INTERSTATE HIGHWAYS, TWO RAILROADS AND THE ONTARIO INTERNATIONAL AIRPORT, ONTARIO IS THE PERFECT LOCATION FOR YOUR BUSINESS TO THRIVE. (909) 395-2005 ONTARIOTHINKSBUSINESS.COM ONTARIO THINKS BUSINESS AS ONE OF THE LEADERS IN SOUTHERN CALIFORNIA, THE CITY OF ONTARIO CONTINUES TO LEAD THE WAY IN BUILDING AN INFRASTRUCTURE TO BETTER SERVE THE NEEDS OF OUR BUSINESS COMMUNITY. With plenty of room to grow, Moreno Valley delivers the right market opportunity, a qualified and motivated work force, the best pro-business environment and an unsurpassed quality of life.